We drive along the bumpy track, back to Old Hall Farm. The road comes to an end at a cattle grid – where signs tell us we can drive no further without a permit from the nature reserve. We stop the car and, as I begin to lace up my walking boots, a bossy woman emerges to advise us not to block the farm entrance. We assure her we are not staying. She seems reluctant to believe us. I wonder if she lives in the rather nice house that I believe is the modern version of Old Hall Farm. 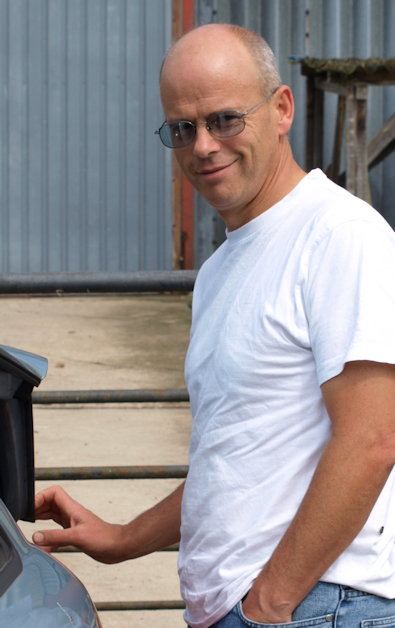 While my husband drives away, I set off across the cattle grid and along the farm track. I come to the sea wall and climb up to find a footpath stretching in either direction. Consulting my map, I realise this is not the start of my route. In fact, this is my return route. I am about to embark on a walk around a peninsula and, after 7 miles of walking, I will end up back here again – a few yards from the start of my journey today. For a moment I hesitate, tempted. I could start here, turn right along the sea bank, and save myself 3 hours of walking around a bleak peninsula. But that would mean cutting out a section of the coast and would, according to my internal rules, be cheating. So I climb back down off the sea bank and continue along the farm track as it meanders northwards, through a nature reserve, to the north shore of Old Hall Marshes. The bank here is overgrown with grass, wet with dew. I decide to try out my gaiters. This new purchase was suggested by David Cotton as an aid to keeping feet dry. After struggling briefly with the unfamiliar gaiters and glad there is nobody here to see my clumsy efforts, I set off briskly, determined to make good progress this morning. The long grass is buzzing with insects. Brown grasshoppers dart away from beneath my feet, popping up in front of my boots in a constant wave of activity the accompanies me along this section of the bank. Butterflies – blue, brown, white and multicoloured – flutter around my knees. Around my arms, small flies dart and buzz. Spiders have laid sticky traps across the path, spinning webs between high blades of grass. As I walk, I gather a tangle of webs on the front of my trousers. Initially, I attempt to brush them off, wiping sticky strands away with my hands and then flicking my hands in the air to try to clear my fingers of the softly persistent threads. Eventually I give up. Within a few minutes, the front of my trousers begins to look like an insect graveyard – sticky webs are intertwined with displaced spiders and their prey – flies, butterflies, beetles, ladybirds… I am the grim reaper of insect life, the collector of little corpses. Little flies extract their revenge on behalf of the insect kingdom. Their plump, black bodies appear innocently harmless and at first I think I am imagining their bites. But no, they are attacking my upper arms. I flick them away constantly. 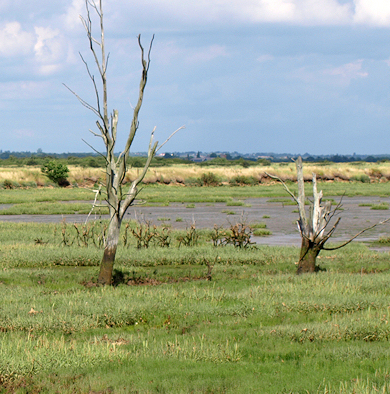 On my left I look over water of Salcott Channel towards a far bank and Mersea Island, visible beyond. There is nobody out here. But a small motorboat is playing up and down the channel, pulling a waterskier. To my right is farmland and then marshland with water and occasional ducks. I gather this nature reserve is a great breeding ground for water fowl, but there is little sign of them today. The gaiters have kept my trousers dry, but the tops of my boots are wet and moisture has seeped between the laces and into the inner part of my boots. I round the eastern end of the peninsula. Here the wind picks up and the grass is dryer. The wind does me another favour too; it blows away the little flies that have plagued me. With the path now dry, I take off my gaiters and my boots. Hanging my socks on a convenient style, I have a snack while I change into dry socks. I have learnt the two most comforting things on a long walk are, firstly, a change of socks and, secondly, a nice bar of chocolate. The path continues round the peninsula. There are plenty of goose droppings on the bank, making walking difficult in some sections. Part of the bank is closed to allow wild fowl to use it as nesting ground – but the nesting season has passed. Some of the geese are still here. I can see them in the distance on the inland lakes within the marshes. But the bank itself is deserted. Following the bank, I am heading inland along the edge of Tollesbury Fleet. I hear music ahead, carried on the wind. At first I think it is my imagination but, no, there is some kind of concert going on in the hills ahead of me. As I return towards Old Hall Farm the music becomes more distinct – the Stones, the Beatles and other 60s songs. Now I am back to the beginning of my walk. I am in front of the rather nice house, which I believe is the new Old Hall Farm house. There is a quay here and some small boats moored. But the tide is out and the boats are sitting in mud, not water. The bank rounds the corner and heads back out to sea again. An elderly woman appears and strides briskly ahead. She overtakes me. I am feeling very tired and find it hard to make good progress. The sea appears to have consumed some of the fields. I see trees damaged, I believe, by salt water. Now dead, they raise bare arms to the sky. I continue along the bank, heading towards the Tollesbury Marina, where I am meeting my husband for lunch. I can see the masts of the boats moored there, but the bank meanders in and out and progress is painfully slow. Finally, I arrive, following the path as it winds through a boat yard and around the edge of the Marina. 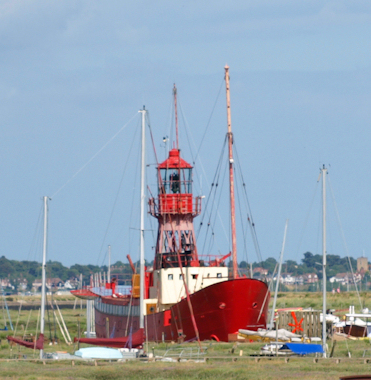 Beyond the moored yachts, I see a strange red boat, perched in the mud. It looks like a floating lighthouse. Later I learn this is Trinity Light Vessel, now used by FACT for spiritual holidays and retreats. Just behind the marina is an empty basin – the old outdoor swimming pond – now unused. There are picnic seats here. I continue further along because I have spotted a pub. No, it is a private yacht club. In fact, there is no public house providing lunches at the weekend in Tollesbury. A terrible shame because this seems an obvious amenity for the village to offer to weekend visitors. Beyond the club, I find a seat, perched high on a knoll, overlooking Tollesbury Fleet and with West Mersea gleaming in the distance. I suspect this is the best viewpoint in the whole area. Now my husband arrives on his bicycle. He has stopped at the village store and has brought a wonderful picnic lunch. We eat in this lovely spot, enjoying the magnificent view. I can see storm clouds gathering. The light fades. There is rain coming. We eat the rest of the food and enjoy a drink. I cannot prolong lunch any further. There is still a long walk ahead of me. This afternoon, I plan to complete this section, around Tollesbury Wick Marshes. 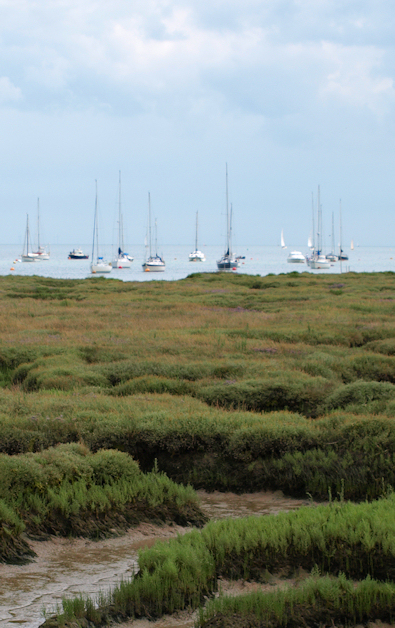 Beyond that, the path continues along the Blackwater estuary towards Maldon, and I plan to do that section next weekend. The sky is dark when we pack up the remains of our lunch and I say goodbye to my husband. The footpath ahead is deserted. The wind has picked up. The light is changing. As I head out along the bank, I can see ships moored in open water ahead and, far beyond, I can see a wind farm. This is the same wind farm that I first saw at Walton-on-the-Naze, off the coast at Clacton. The blades gleam white against the darkening sky. Now the strange, pre-storm light has changed the colours of the landscape. The mud has taken on a pinkish purple hue. The water looks like pale, blue steel. The inland water shines golden, like polished copper. I take photographs, not sure how the colours will look, but wanting to capture the magic of this colour change. The sky darkens further. Ahead of me I see an old pill-box with, bizarrely, a “smiley” face painted on the side. I stop here and stow my camera deep in my rucksack. Then I put on my waterproofs, making sure my iPhone is tucked deep into a waterproof pocket. Just in time. As I set off from the pill-box the rain hits my back. The sky becomes very dark indeed. Luckily, the rain stops some few minutes later. Just as I reach a point on the walk I have been looking forward to. Here is the remains of an old pier. Once upon a time there was a doomed attempt to launch Tollesbury as a seaside resort to equal Clacton and others. Build a fine pier and the trippers will come. The locals hoped boats would dock here, perhaps bring tourists from other resorts. They even built a light railway, to link the pier with the village. Sadly the venture was doomed and the remains of the pier were blown up at the start of World War 2, to prevent the structure being used as a landing post for German invaders. 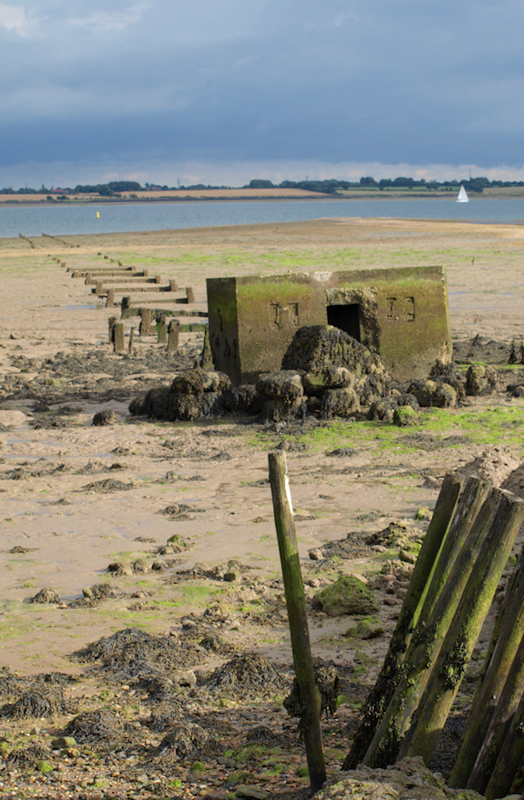 Now all that remains is the base of the structure – visible in the mud with the tide out. There is a little sign, explaining the history of the pier venture and also describing the wildlife that inhabits the area, now undisturbed by tourists. Beyond the pier I can see the menacing silhouette of the large building. I first noticed this building at the end of my last walk. From the map it is clear that this must be Bradwell Nuclear Power Station. I later learn that Bradwell is no longer in use, being one of our first nuclear reactors to be closed down in 2002 and now in the process of being decommissioned. Just beyond the remains of the pier, I turn inland, following a footpath that takes me up the side of Mill Creek, close to the route of the old dismantled railway. From there I follow the footpath to a farm track and then reach the end of a narrow road. As I walk through the late afternoon sunshine, I wonder what it was like for the local people when they found out that their pier was to be blown up. I wonder if there were children, or grandchildren, of the original builders who witnessed the final death of this doomed dream. And now there is the demise of the nuclear reactor too. Our human projects seem puny and fragile under the weight of this wide sky, swamped by the vastness of this empty landscape. This entry was posted in 04 Essex and tagged Blackwater, britain, british, coast, coastal, england, english, Essex, hiking, insects, light, marina, marsh, nature reserve, nuclear, path, photography, pier, power station, rain, ships, Tollesbury, walk, walker, walking. Bookmark the permalink. What a wonderful web site you have! I have linked to it – of course. 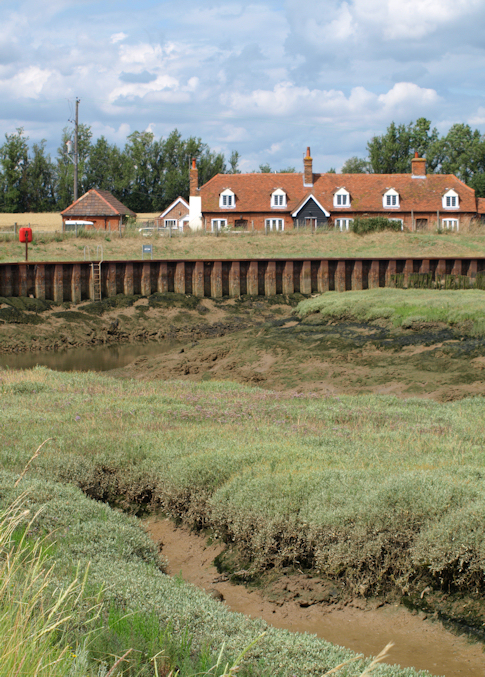 Suffolk is a beautiful county and I very much enjoyed that section of my coastal walk. 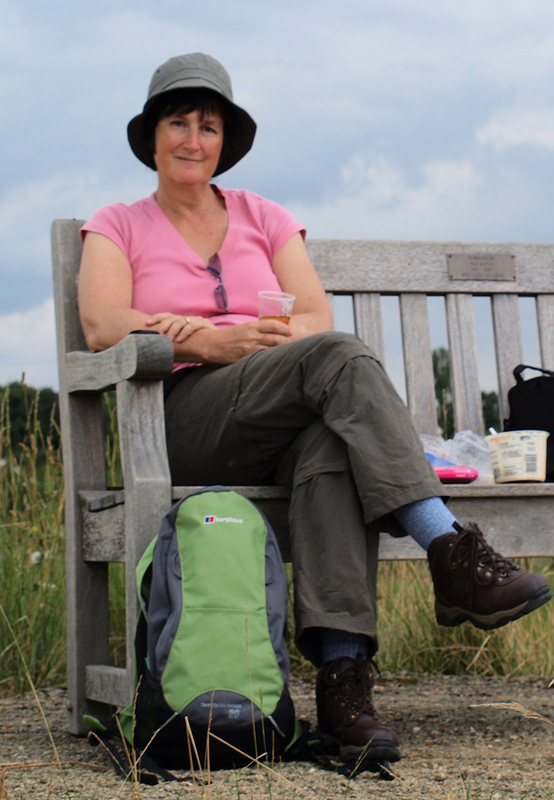 I am a little behind with my blogging – now am in the marshes and on the way to Burnham on Crouch. Maybe we will run into each other one day! Ruth – unfortunately I am not privvy to the intentions of parliament. I am involved in the publication of the legislation and am proud to have been involved in the development of new legislation.gov which is built on the principles of transparency and open data. Having said that I am keeping tabs on this piece of legislation as it has a lot of benefits for us walkers. I seem to recall that Norfolk was going to be one of the initial counties to implement access but with the proposed budget cuts I think this has been put on hold. The section between Cromer and Lowestoft is the only section without a long-distance path for the whole of Norfolk and Suffolk. Like you say, fingers crossed! Enjoyed reading your post. 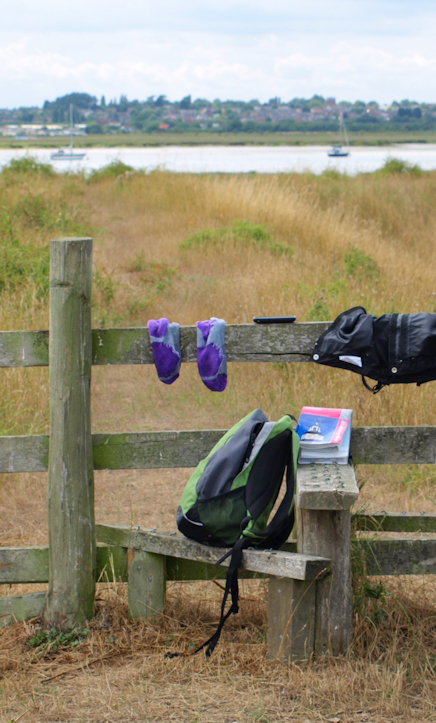 We walked a circular route to/ from Tollesbury to coincide with a high tide. How sad that the dream came to an end when the pier was blown up. Yes. Although I’m glad the place didn’t become a busy resort like Cromer.